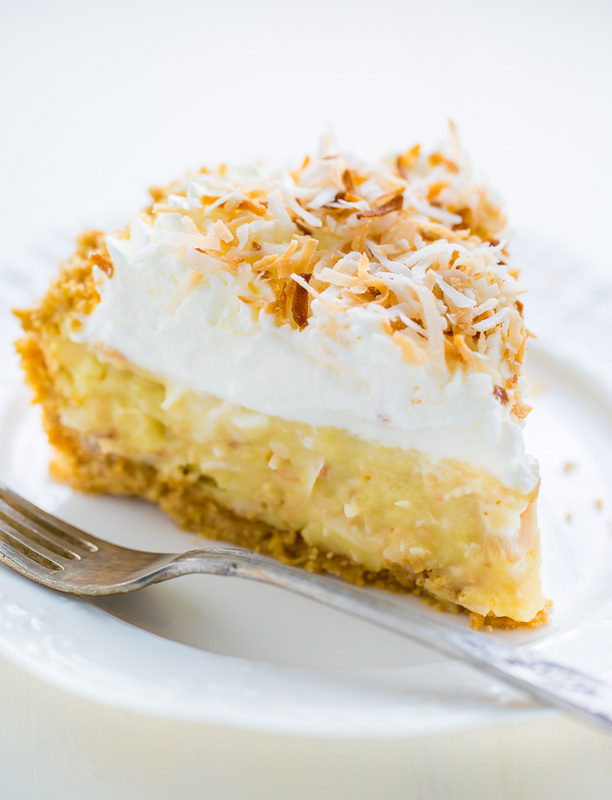 Homemade Coconut Cream Pie is rich, decadent and worth every dang calorie! This is the kind of pie you serve to people you really love. It’s the kind of pie you savor… and eat slowly… the kind of pie you might even close your eyes to enjoy. It’s the kind of pie that floods you with pleasure… brings memories rushing back… and comforts the soul with just one little bite. This, my friend, is my favorite coconut cream pie. Strangely, this coconut cream pie was inspired by… coconut body butter. Yup. I’m not even kidding. Last week I was digging around my best friends beauty cabinet and found a round little jar of Trader Joe’s butter body and decided to give it a go. All I can say is OMG. If you love coconut and have a TJ’s near you, you need to try this stuff. Promise I’m not getting paid in any way to say that!!! It’s just that amazing. It’s rich and creamy and smells like – wait for it – COCONUT CREAM PIE. One whiff and I was hooked. I seriously could not get home and bake this pie fast enough!!! After a few weeks of tweaking and testing, I finally nailed down what I think is the best coconut cream pie… in the world. Or at least the best I’ve ever made and/or eaten. 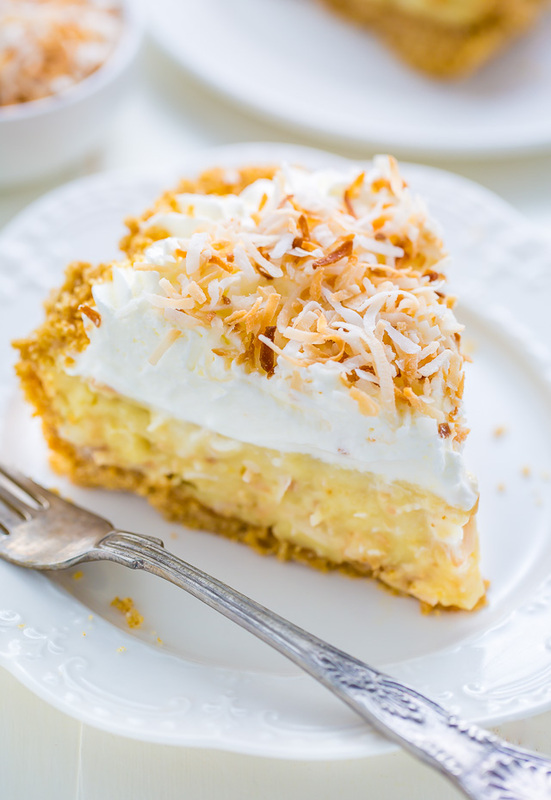 And you should know, I grew up in a house abundant with coconut cream pie! better than the bakery, not to mention WAY cheaper! and sure to be your new favorite, too! If you’ve never made a pie from scratch before, fret not! I’ve included plenty of step-by-step photos, notes, and a thorough recipe below. And as always, if you have questions, just ask in the comment section below. The most important thing to do is read through the recipe completely before you begin baking, that way you have everything you need ready to go. 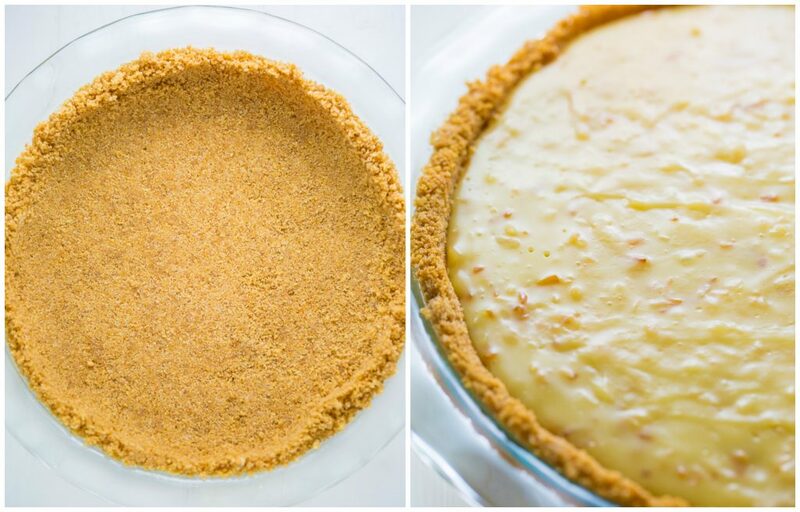 The first thing you’ll make is your graham cracker crust. For this you’ll need graham cracker crumbs, granulated sugar, melted butter, and a pinch of salt. You have two options for the graham cracker crumbs: buy them already crushed (in the baking aisle) or buy a box of graham crackers and pulse them into crumbs in a food processor or blender. There’s no wrong way! I prefer to buy boxes the box of graham crackers and pulse them myself because I get more for my money, but if you’re short on time, the graham cracker crumbs really come in handy! Be sure to time your crust when you place it in the oven. It needs 10 minutes – no more, no less. You’ll also want to cool the crust completely – on top of a wire rack – before adding the cream filling. I find it takes about 30 minutes to cool. You’ll want to plan ahead time wise as this pie must cool completely before being topped and sliced. 4 hours minimum, however I prefer to chill mine 6 to hours, for easier slicing. This pie may be made and kept covered in the fridge 2 days in advance, however once topped with whipped cream and sliced, it is truly best eaten within 24 hours. 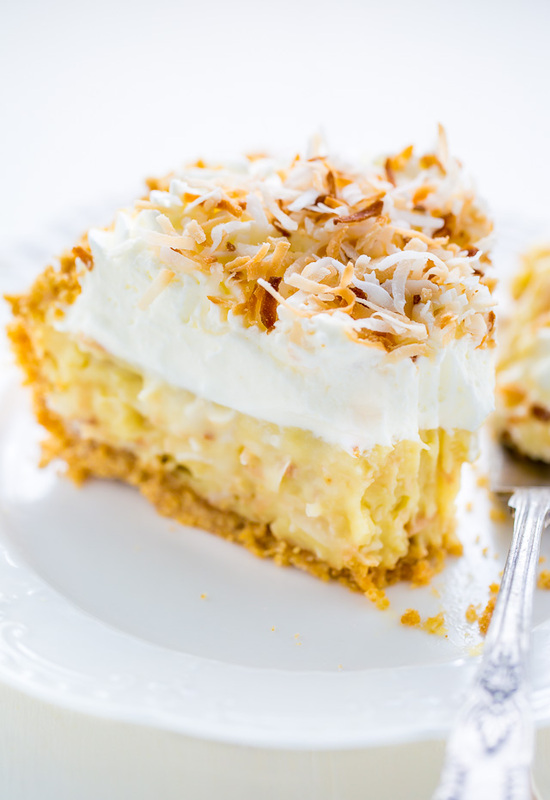 So much deliciousness in this coconut cream pie! I hope you bake one soon and share it with folks you love. Enjoy!!! 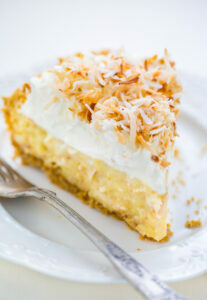 This is seriously the BEST Coconut Cream Pie! Rich, creamy, and so flavorful! A must try for coconut lovers! Preheat oven to 325 degrees (F). 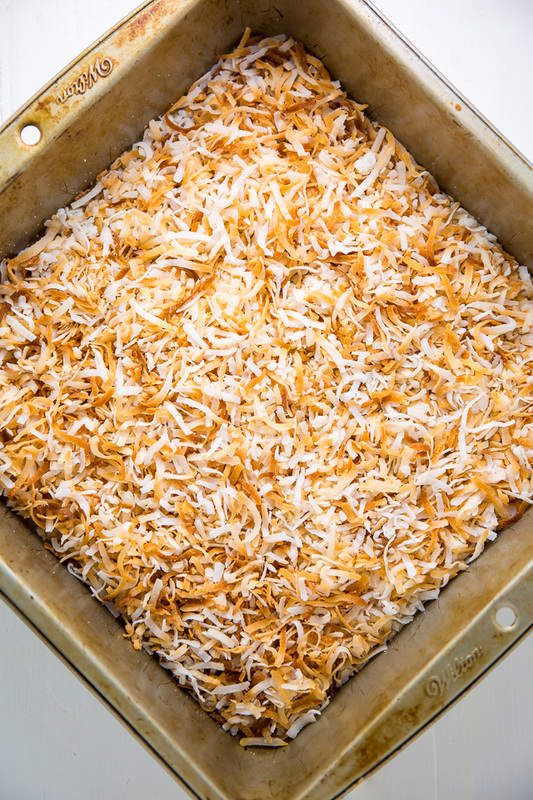 Spread shredded coconut onto a large baking sheet in a thin layer; bake in preheated oven for 8 to 10 minutes, or until lightly toasted and golden, stirring a few times to ensure even color. Remove from oven and set aside to cool. In a large saucepan combine the egg yolks, coconut milk, whole milk, heavy cream, granulated sugar, brown sugar, cornstarch, and salt; whisk well to combine. Bring the mixture to a light boil over medium heat, whisking constantly. Once the mixture reaches a boil, reduce the heat to medium-low and, whisking constantly, cook another 2 minutes. Remove mixture from heat; whisk in vanilla extract and 1 cup of the toasted coconut. Pour into crust at once. Smooth the top with a spatula, then cover with plastic wrap and refrigerate for 4 hours, or until cold and set. In the bowl of a stand mixer fitted with the paddle attachment, or in a large bowl using a handheld mixer, beat the cream until it begins to thicken and hold soft peaks. Add in the confectioners' sugar and vanilla and continue to beat for another minute. 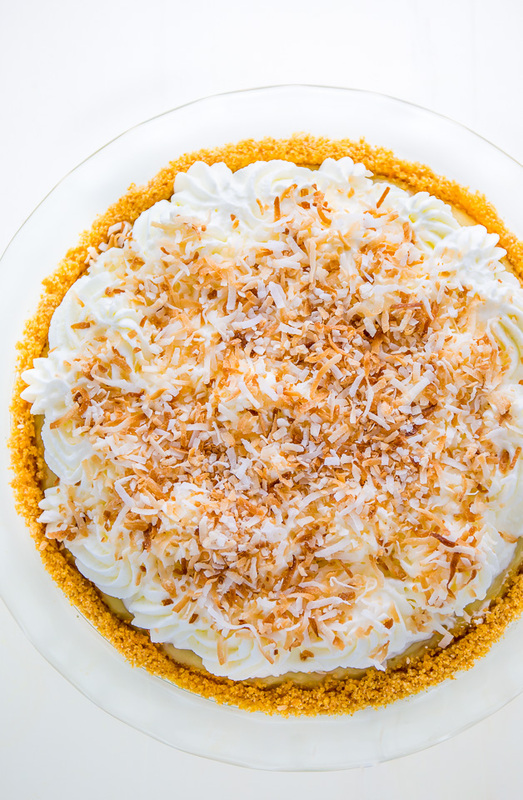 Spread or pipe the whipped cream over the cooled pie, and sprinkle the top with remaining toasted coconut. Slice and serve, or keep chilled - covered in the fridge - until needed. While I find this pie is best eaten the day it is made, it will keep, stored in the fridge and covered tightly, for 3 days. Hi. This looks divine! Question: What is your opinion as to if I cut the pie into individual slices and freeze each? It is just myself & my husband; freezing slices and taking them out when we want them later would work well for us. I suppose we would let them thaw for at least a couple hours prior? Thanks. Hi Michelle. You can definitely freeze the pie slices, just be sure you don’t add the whipped cream topping, as that won’t freeze well. I would suggest thawing them for a few hours, then topping each piece with fresh whipped cream and toasted coconut right before serving. I am a huge coconut cream pie lover. I was the pastry chef at a restaurant and always made the pie with a regular pie crust and a meringue topping. It was our biggest seller and absolutely delicious! I’m excited to try this recipe with a graham cracker crust and a whipped topping! I can’t wait to hear how it turns out, Annie! This looks amazing! I love coconut! Love the coconut garnish on top. the toasted coconut sprinkled on top of that is to DIE for!!!! It will hold up better with the Meringue for storing in the freezer too. Now go give that a try , you’ll be hooked. Thanks for a great coconut pie recipe. After being cooked, is the mixture still supposed to be liquidy? I didn’t need a spatula to even out the mixture because it’s so liquid…please help! Hi Hina. The mixture should have thickened up as you cooked it, but will continue to set as it cools. How did you pie turn out? My son has ASD & recently saw a program which mentioned coconut cream pie. He became OBSESSED with the notion & begged me to make it for him. I’m quite skilled in the kitchen so the idea wasn’t a problem but time always is. He would ask “are we making the pie today? when?” & stand in front of the clock or the calendar… Anyway, I read a thousand recipes & landed on yours. It was absolutely delicious! Easy to make & good to the last bite. He loved it & went to bed a very happy little boy in his “coconut cream pie-bliss” state last night. Graham crackers are not available in Australia so I used Arnotts Butternut Snaps for the base (which are slightly caramel in flavor). Perfect. Thanks so much for the recipe & for sharing all your recipes. Next time I have a dinner party I might make this & garnish with banana flambe just to be extravagant. Hi Melody! Thank you so much for taking the time to leave this comment – it made my day 🙂 Much love to you and your son! Hi! This looks absolutely delicious! Quick question… in the recipe, there is no coconut extract so I was wondering if it is ok to add some to the custard filling? Can’t wait to make this!!! Just made this delicious pie! This one is a keeper!! The only difference was I made wih regular pie crust. This will be my go to for coconut cream pie every time. Thanks! do you think I can make it using homemade coconut milk? Thanks!